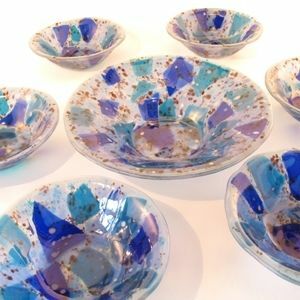 An 11" fused glass bowl together with six 8" bowls made a wonderful wedding gift for some lucky couple. Sometimes a wedding guest with a lower budget chooses only the large bowl (great for salad, potatoes, or vegetable) or a collection of small bowls (suitable for soup, individual salads, cereal, fruit, and ice cream). We check the bride and groom's wedding registries before designing the dishes so they will coordinate with their other tableware or linens. Our process involves combining sheet glass and ground glass and fusing it at about 1450 degrees in a kiln. Subsequently we slump the fused glass over a mold at a lower kiln temperature to achieve the desired shape.